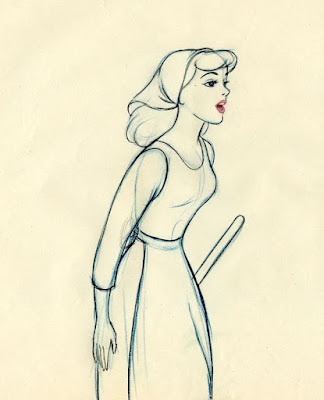 Distorting parts of a character is an old staple in pencil animation. 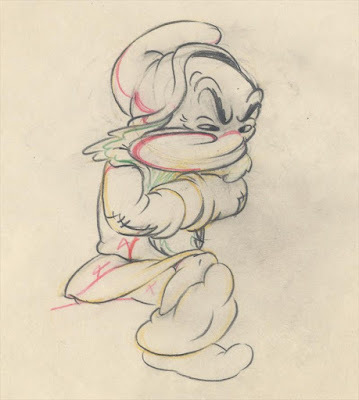 It was perfected by Disney artists as well as other studios during the mid 1930s. During fast character movement a particular problem arises when trying to achieve smooth looking motion. How do you create quick moving animation without making it look rigid? When studying live action films you'll discover a "blur" during a fast head turn, for example. 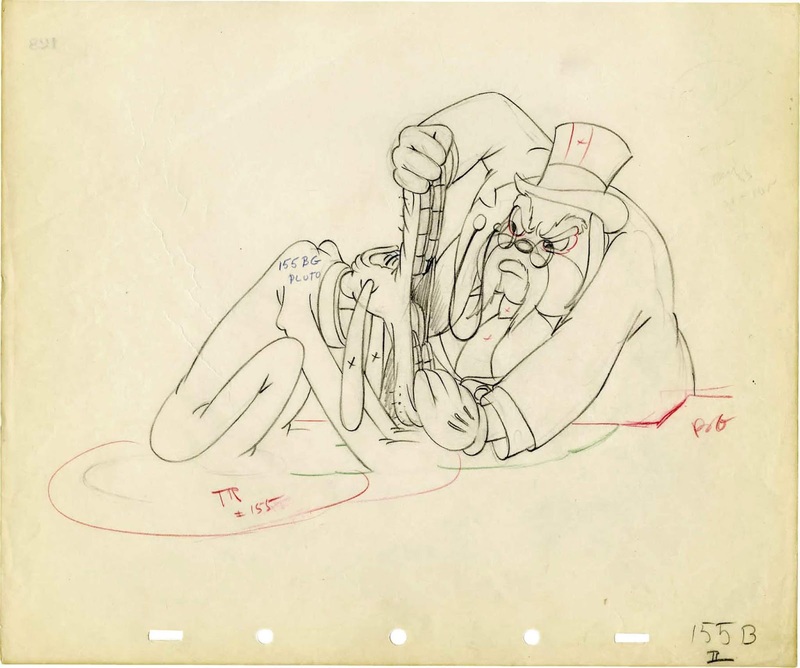 Since conventional animation cels always had sharp outlines and flat color, without distorting, the animation would look stiff during fast movements. The first image above is from a scene with Grumpy by Bill Tytla. He occasionally went to extremes in order to get smooth looking action. 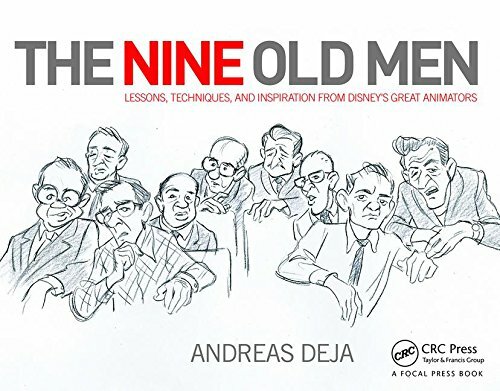 He is not afraid to drag Grumpy's nose to a point where the character becomes almost unrecognizable. The idea is for the viewer to feel the fast motion, and not actually register it by single drawings. And...this drawing is seen on the screen for one frame only. If exposed for two frames the illusion of smooth, quick motion would be ruined. Study Tytla's Stromboli frame by frame. 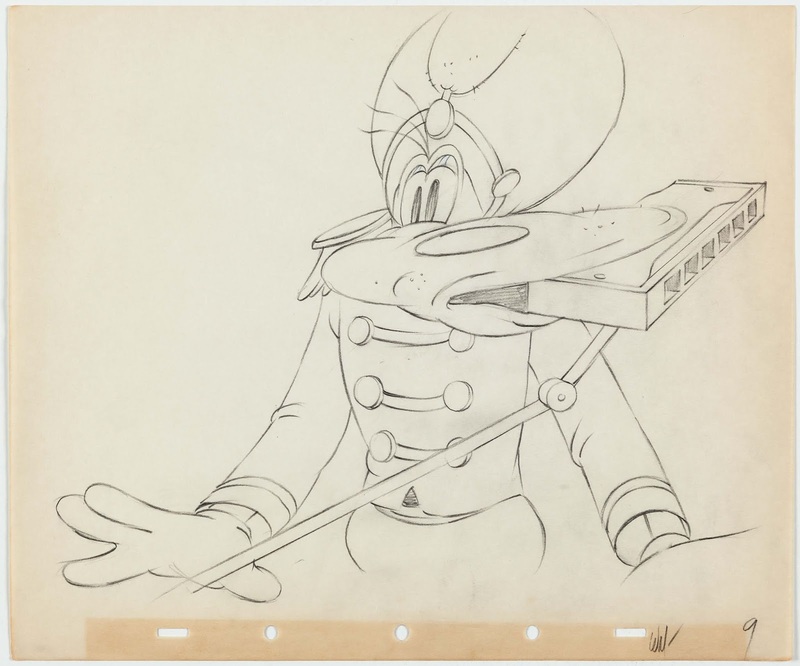 His distorted drawings during the character's speedy, erratic moves are spot on. And legendary! 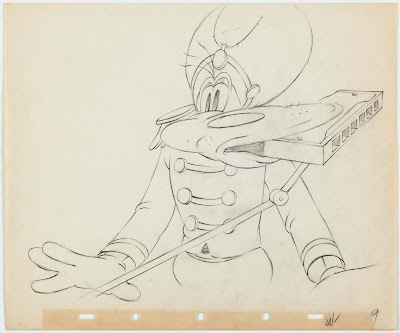 The next drawing is from an Art Babbit scene with Goofy. 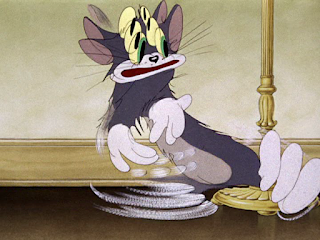 The short film is Mickey's Amateurs from 1937. Goofy is playing multiple musical instruments at the same time. Here Babbit has the character turn screen left while the muzzle and harmonica are way behind on screen right, to eventually catch up with the head's motion. 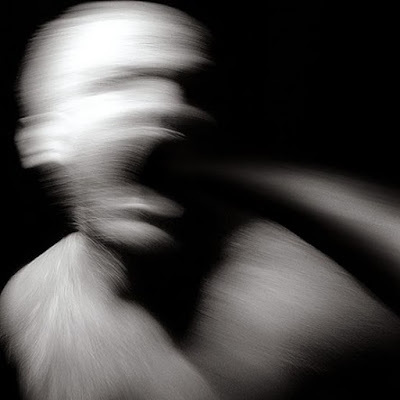 You get a sensation of loose moving flesh. Fred Moore also helped pioneer this principle, though in more subtle ways. A drawing from Society Dog Show, 1939. Pluto's extreme open jaw is not in motion here, yet it is very distorted, far from what a real dog's jaw could do. 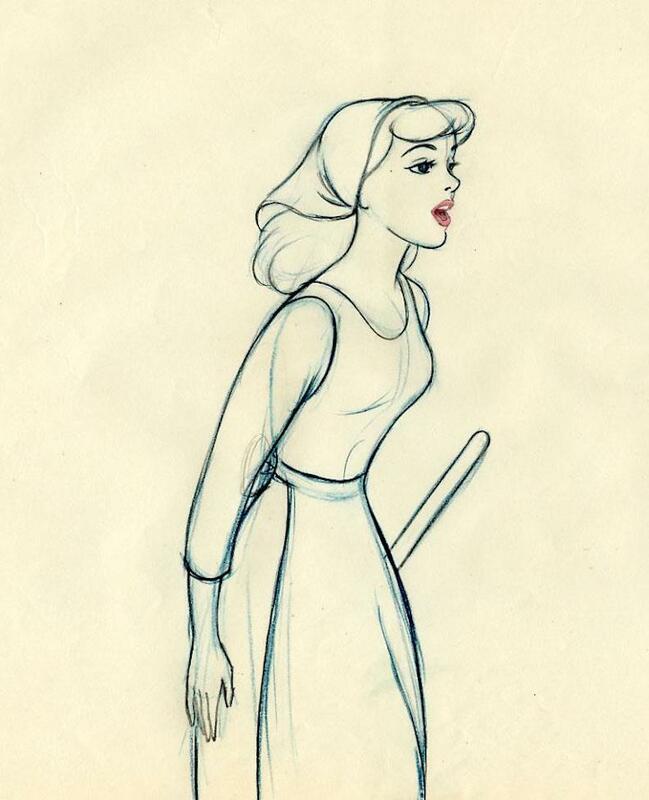 None of this is possible when animating a character like Cinderella, whose design is realistic and believable at the same time. The challenge here was to work with live action reference while trying to make the scene look "animated", not rotoscoped. Its all about subtleties. 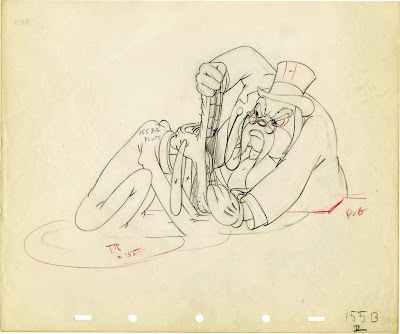 At MGM animators had a blast coming up with ways to make fast action "look easy on the eyes" of the viewer. Partial multiple imaging plus dry brushed speed lines. What amazing images! Even stop motion animators who originally photographed their models one crisp frame at a time, now tend to add motion blur to their work. This certainly adds realism when viewed on the screen. 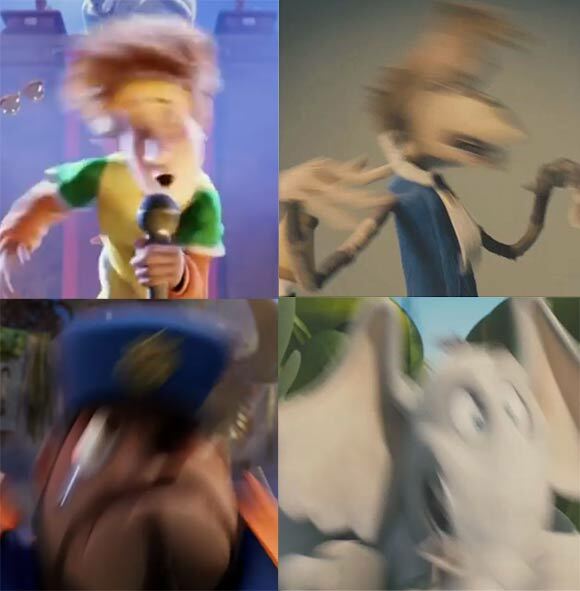 CG animation is full of motion blur. 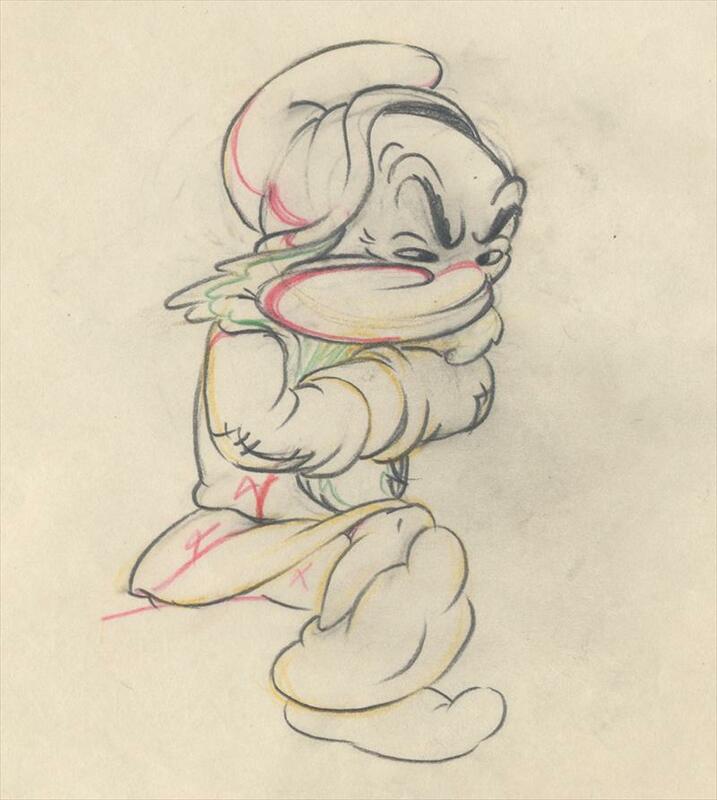 My own most distorted animation would be for Who Framed Roger Rabbit. It was a thrill to work so loosely on the characters. And having had this experience of using basic animation principles in such a broad manner sure helped me with my future assignments. Favourite Disney distortion: the horse in Cinderella, when he's passed over by the Fairy Godmother to pull the pumpkin coach. Only one stretched drawing but it's so telling. I worked on a show that had a cool smeary style, and it was a ton of fun! You've just got to make sure the spacing is aggressive enough to make it work. This is a great post. Thank you. 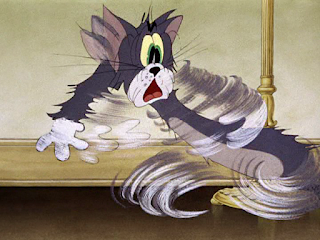 Chuck Jones was a master at this (The Dover Boys and Rikk-Tikki-Tavi, which had some astonishing "smear" animation). The Warners cartoons have so many great examples. One Disney example that comes to my mind is when Bagheera suddenly realizes Kaa is going to eat Mowgli and wakes up (it's barely a few seconds long). Incredible sense of timing.